Like this pretty from Zoya. I have had my eye on her for forever and she is so pretty. I really liked this look because it was simple, springy but still a little edgy. Here I used two coats of Zoya – Neely on all my fingers except my ring finger. On my ring finger I have two coats of Catrice – London’s Weather Forecast. I then took the polish brush of Neely and painted just a strip of mint all the way up the centre of my nail. I then added my topcoat one nail at a time and while it was still wet I added my studs. I bought these studs from Born Pretty Store and you see them here. They come in a wheel with a whole bunch of different shapes in gold and silver and a few black. I am loving these studs and I can’t wait to use them again. Especially the stars! Aren’t these two colours beautiful? I think Neely is perfect for the season and London’t Weather Forecast is gorgeous on it’s own and is amazing with any other colour. What do you think of my minty stud nail? Have you tried studs yet? Let me know. I hope you have a great weekend! It’s totally gorgeous. I love the minty Zoya.. Def going on my wish list. Thanks Lyn. I agree, Neely is so gorgeous. Both these polishes are GORG!!! I love them together though, very cool combo! Again Neely complements you SO well!! the black studs are just awesome with this mani! Love it! Yay thanks so much V! I also thought they worked pretty well together and how cute are those studs! I can’t wait to use studs again. I haven’t tried studs, but need to. I am just always scared I’ll buy the wrong size if I buy them online because I am bad at judging that stuff, haha. I am also a huge mint fan (and also love the flavour) and I just realised I don’t use it nearly enough. I should! Hahaha I know what you mean. I see all the sizes, close my eyes and pick one 😛 Or better yet get one with a variety. These ones I got had a few different shapes and sizes which helps. Ooooh, studs! I am intrigued! You know my weakness for studs! But both these polishes are killer! 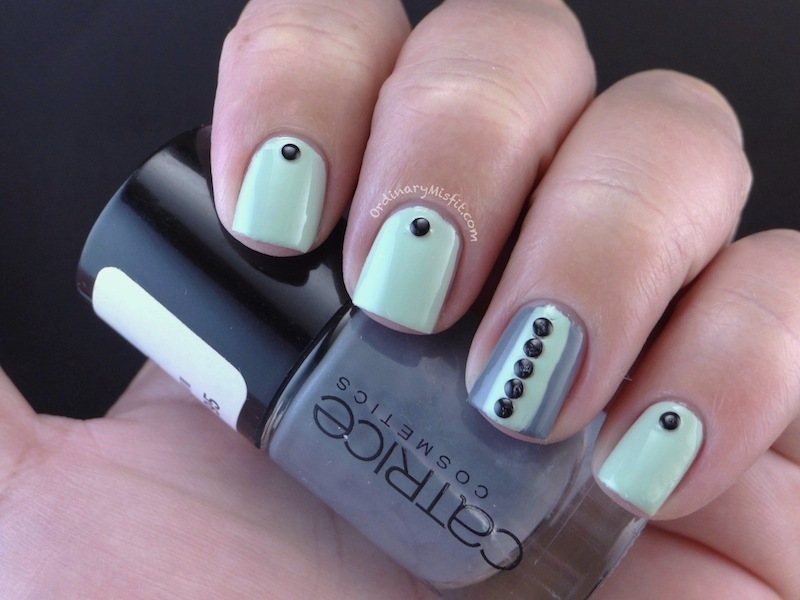 Love me so grey, love me some mint so they go stunningly together! Gorgeous as always M!